This post shows you How to Install Docker on Ubuntu 18.04 with step by step procedure. 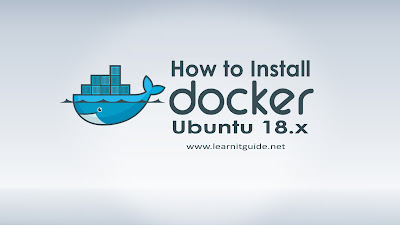 End of this post, you will be able to understand how to install docker on Ubuntu 18.04. 2. How to Deploy Docker’s official GPG key? Before installing docker on ubuntu, update the packages index using the 'apt-get update' command as below. Once you have updated your packages index, lets deploy the Docker’s official GPG key and install Docker. 2. How to Install Docker on Ubuntu 18.04? Use "apt-get install" command to install docker with required dependencies automatically. 0 upgraded, 4 newly installed, 0 to remove and 55 not upgraded. Need to get 30.1 MB of archives. Created symlink /etc/systemd/system/sockets.target.wants/docker.socket â /lib/systemd/system/docker.socket. Created symlink /etc/systemd/system/multi-user.target.wants/ubuntu-fan.service â /lib/systemd/system/ubuntu-fan.service. We have successfully installed docker as expected. Lets verify the docker information. Use below docker command with "-v" option to know the docker package version with build release information. Also we can use "version" argument along with docker command to know the relevant information about the docker package. That's all about the Installation of Docker on Ubuntu 18.04, Its pretty straight forward. Going forward, we will play more with docker tool.